I have been neglecting the white chocolate. While I have been ganaching, enrobing and molding large quantities of the bittersweet and the milk, the white keeps getting pushed farther and farther back into the chocolate cupboard. And it’s not like it is the white chocolate’s fault. It’s awfully good stuff of its kind. There I go, again. Expecting it to be dark. Well, it’s not. And this week, I am going to celebrate the fact that it is pale, because it makes a perfect canvas for tinting and its mild sweet flavor makes it perfect for combining with other flavours. And I start thinking about citrus fruits. 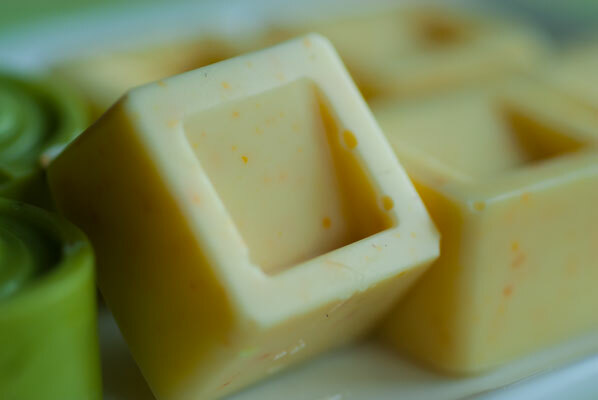 And while oranges are a classic accompaniment to darker chocolates, I have a feeling the whole citrus family blends well with the light sweet taste of a good quality white chocolate. This slight obsession with things citrus might have started because we are in the middle of winter, and all of us have had a hankering for freshly squeezed juice. It’s a treat I love to give the boys when they roll out of bed in the morning, eyes glued shut, and not looking forward to first class. This completely contradicts the “eat local” philosophy we have been trying to support – citrus fruits just don’t grow in Vancouver – but I stretched my conscience to include Buck Brand citrus fruits from California. 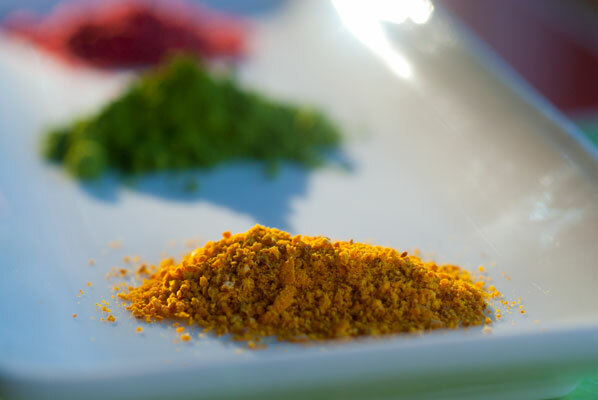 They are excellent, traceable, fully organic, and family farmed … and quite delicious. I am able to score grapefruits, oranges, Palestine limes (which were actually free, because I bought the other stuff) and Eureka lemons, at my latest run to our local grocery, Thrifty Foods, although this reflects only a small sampling of the weird and wonderful fruits Buck Brand produces. I love the fact that there is a story for each of the fruits, and gentle directions on how best to enjoy them, including “run your hand over the lemon to release the fragrance”. They brush each one by hand with a horsehair brush, and use no commercial wax. Mmmmm. 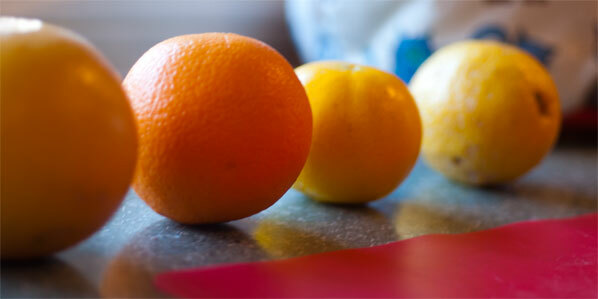 The white snow outside today makes a crisp counterpoint to the fragrance of citrus. And in my searching for citrus and chocolate combinations, I come upon a whimsical and delightful website, created by Jojo Krang, dedicated to creating eye-catching foods. 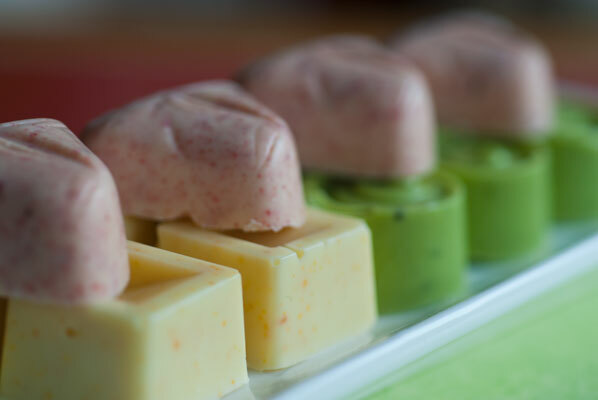 I love the photography here, and the colours of these little blocks of tinted white chocolate make me think of gorgeous polished stone. 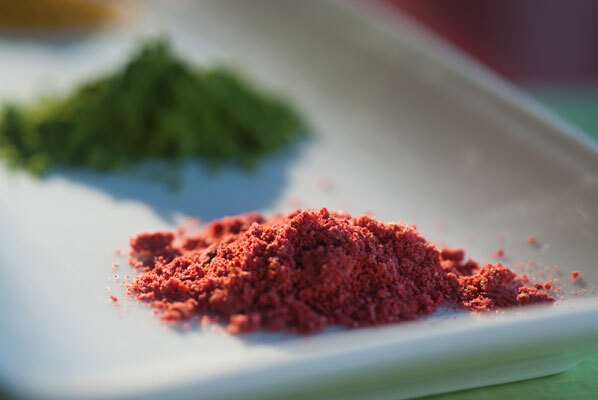 I love the fact that Jojo has played with natural substances, such as beet powder, freeze-dried berries, seeds and spices to come up with the shades, and I know I must give a few of them a try. 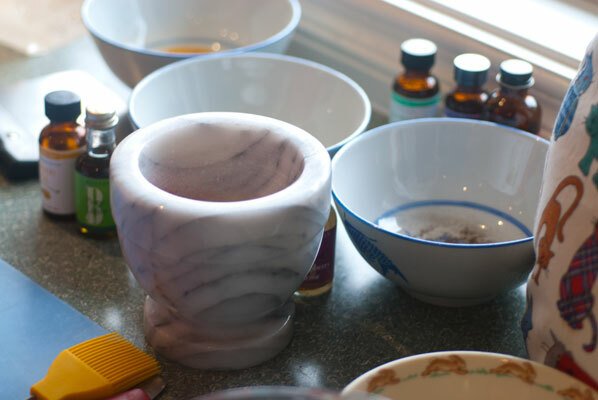 I have never been so happy to own a mortar and pestle, as it is getting a real work-out, today. I feel like the apothecary in Romeo and Juliet (an unfortunate comparison, perhaps). I zest the fruits, dry them in the microwave for a full 5 minutes, at which point they are very hot, and must be carefully handled. 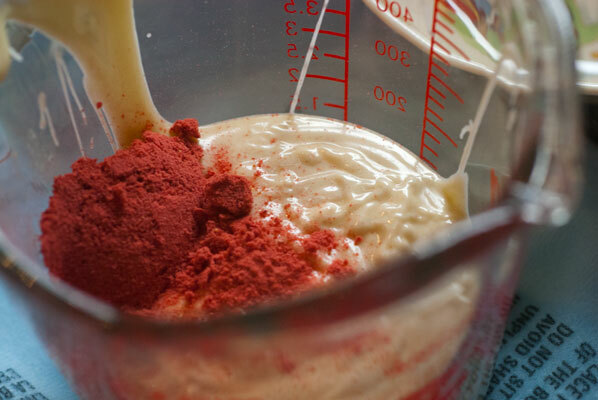 This does result in a crackly, dry product which is very easy to crush and powder in the mortar and pestle, and I soon have bowls of lemon, lime, grapefruit and orange zest, along with a bowl of powdered, freeze-dried red berries. I have also acquired a small can of matcha green tea powder, as I adore the fresh Japanese green tea chocolates from La Chocolaterie. And now, to temper. 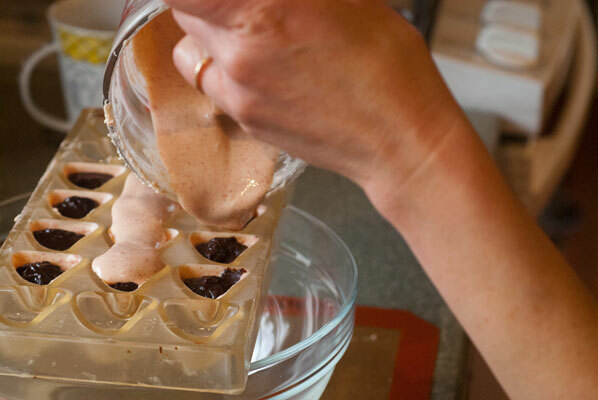 Although Jojo says she just melted the chocolate, mixed in the powdered colour, then left them to set in silicon molds, I do want these to be in perfect temper. I prepare a pound of white chocolate using the seeding method (my current favourite method), with 25% of the total weight of chocolate reserved for seed. I will divide this into three, to be flavoured with matcha, grapefruit zest, and dried berries. All goes well, using the microwave on 50% power to melt the chocolate to 45 degrees C, and my new, accurate thermometer is invaluable, as I stir in the seed chocolate, and bring the temperature down to 27 degrees C.
I finally purchased a heating pad this week. 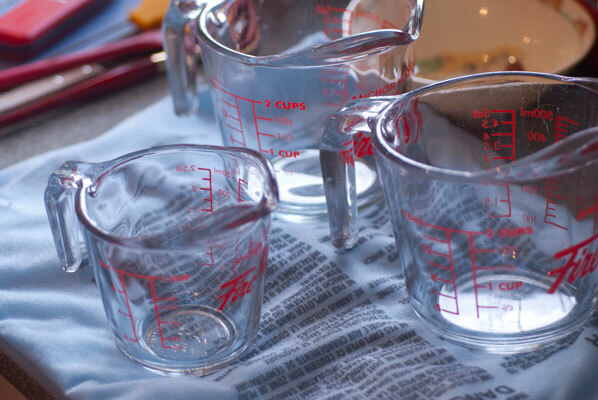 I sit the glass measuring cups I will be using to mix the differing shades on the pad, set to high. 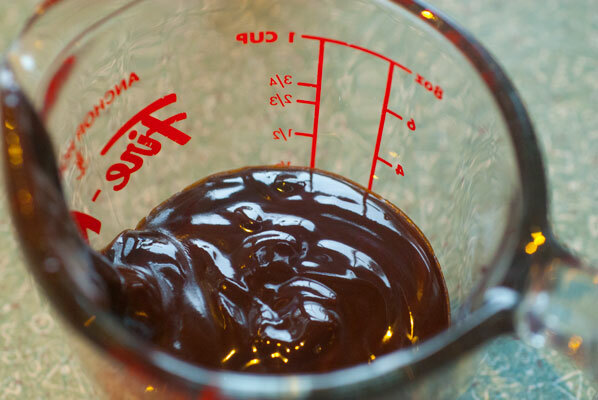 When I pour the tempered chocolate into them, because they are slightly warm, the chocolate will not shock. Working as quickly as possible, and once again, feeling like a chemist, I pour the white chocolate into the three waiting measuring cups, add in the powdered colours, stir like mad, and get them into a series of molds, both silicon (as I happen to have the very one Jojo used), but also using the professional rigid poly-carbonate molds I have come to revere. This is my first opportunity to use one my partner picked up a few weeks ago. It’s charming, and perfect reminder of him – sailboats. The colours are not vivid, but instead, some wonderfully mottled, earthy tones, which remind me of marble or granite. I sharply bang the poly-carbonate mold to settle the contents, but I cannot do that with the flexible silicon ones, and must settle for vibrating them back and forth in my hands, to hopefully release any air bubbles. The good news is, the chocolate is in temper, and later, the release from the molds is trouble free. The sailboats look wonderful, but there are a few pockets in the cylinders and blocks unmolded from the silicon. Definitely a drawback to this mold – or perhaps my technique is at fault. I must say, that I pretty much guessed at the amounts of colour powder to put into each sample, as the ratios Jojo was using were for, I suspect, much smaller quantities of chocolate. Perhaps that is why I ended up with the initial results I did. Hmmm. Upon taste-testing, it is very hard to discern the grapefruit at all but there is a pleasant zesty texture and perhaps the merest lingering hint of citrus. The berry ones look beautifully rosy. When I first taste this one, the white chocolate is prominent to begin with, and it is only as I am swallowing that the berry comes in. A nice surprise at the end, but I would still like a more pronounced berry flavour all the way through. 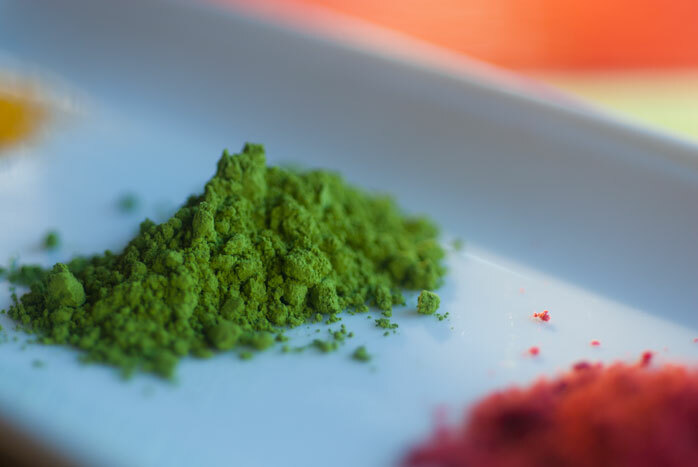 The matcha cylinders are a wonderful mossy green colour, and the flavour does not disappoint. Mmm. No flavour adjustment necessary, here. I decide that I need to tweak the flavour hit up, and temper another pound of white chocolate. This time, I divide the chocolate into two cups, and add ALL the remaining zests (lemon, lime and orange) to one half, the rest of the berries to the other half. 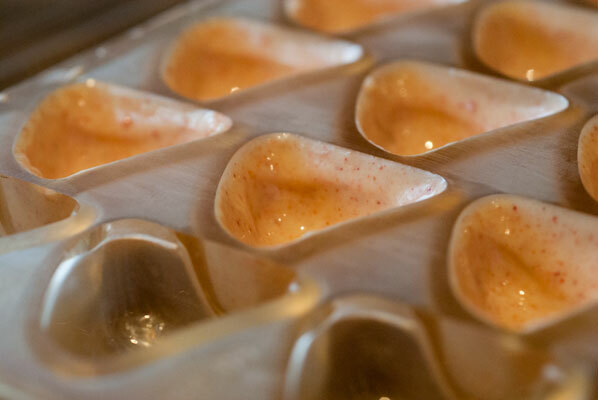 I put the citrus chocolates into my favourite heart mold (I have decided to eschew the silicon ones completely), and turn the boats into hollow molds. I put them aside to set, and get to work. 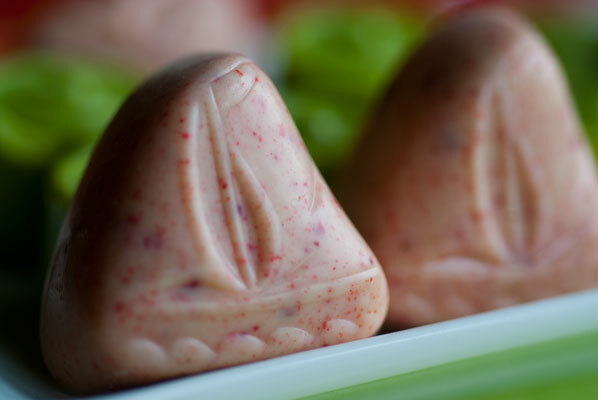 I have decided to turn the sailboats into berry white chocolate shells, filled with dark chocolate raspberry ganache. And I just happen to have some wonderfully crystallized ganache left over from last week’s enrobing attempt, in my refrigerator. 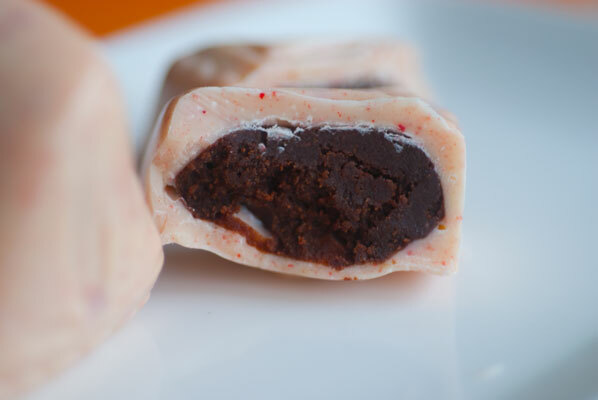 I soften the ½ cup of ganache in the microwave slightly, and add 6 drops of Boyajian natural raspberry flavour. The consistency is actually very good for filling, however I think I have lost some of the lovely texture the ganache had. Oh well, sacrifices must be made! 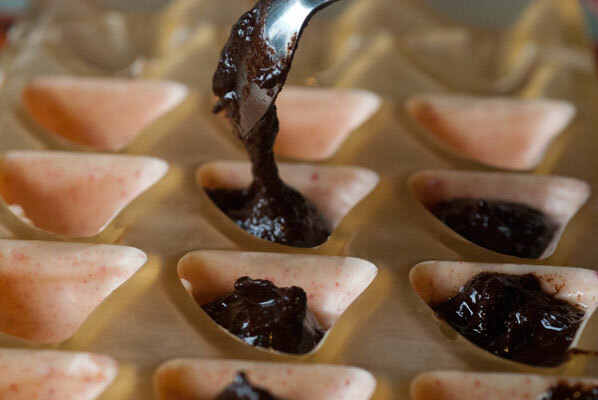 This goes in to the sailboat shells, once they’ve hardened, and after a few more minutes, to allow the ganache to settle, I put on a backing coat of berry chocolate. 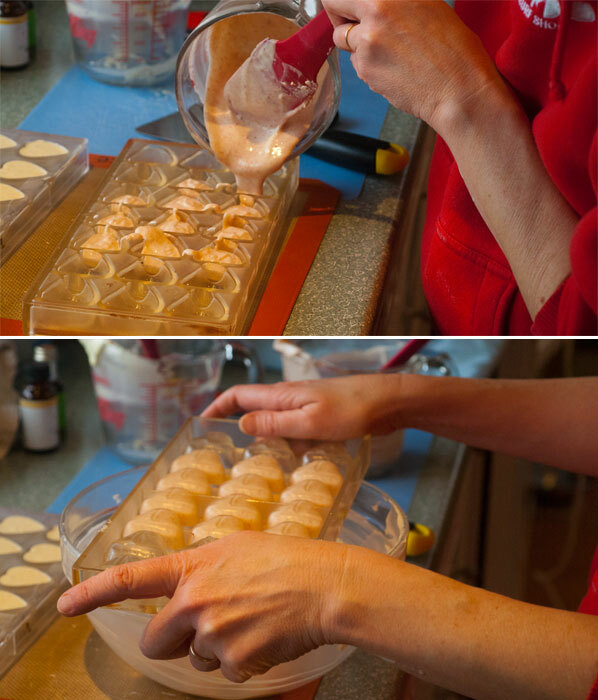 The next morning, I flip the two sets of molds over. The chocolate actually pop right out! I do a little happy tempering dance. And now, the moment of truth. 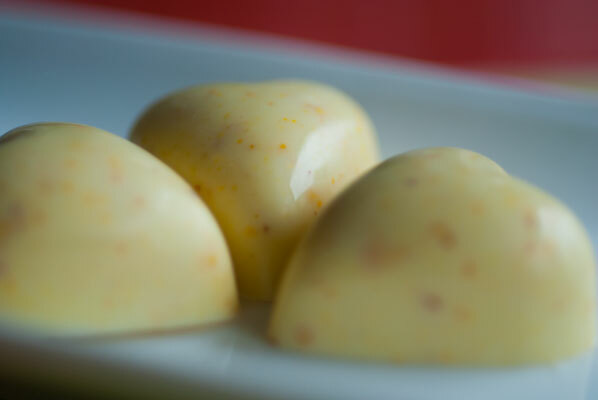 The citrus hearts are absolutely yummy, and the colour is a satisfyingly deeper shade of yellow/orange. I really like the combination of zests. I cut one of the ganache filled sailboats in half, and pop it in my mouth. And now the dance is accompanied by a song, somewhat muffled by the quantity of chocolate in my mouth, but oh, these are good. I am so happy, and when my partner tries the other half, he concurs: “I think you’re really on to something, here”. Maybe it’s the cute little sailboat molds. 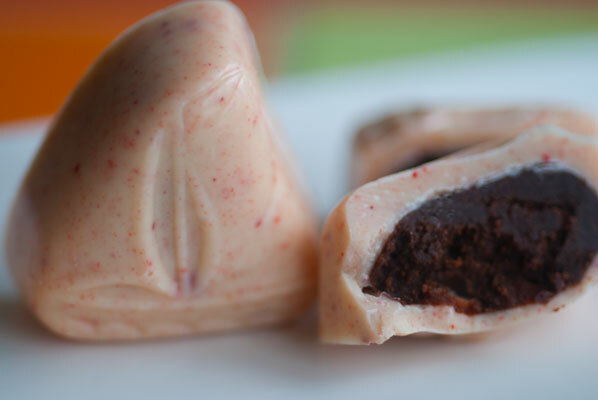 Maybe it’s the lovely earthy colour of the white chocolate, or maybe it’s a good simple ganache and a little raspberry falvour, but the alchemy of the things together has given me, I think, a signature chocolate piece. It is with great pleasure I introduce: the Berry Boats.